Metric or imperial? The bolt head normally has lettering or other marks to identify the type it is. Metric bolts have the makers name at the top and a number at the bottom. This number gives the hardness of the bolt. Standard high-tensile bolts are marked 8.8. The range goes from 4.6 (softest) to 12.9 (hardest). Imperial bolts often have lines radiating from near the centre to the edge of the head to identify hardness. Imperial hardnesses start from 2 (softest) to 8 (hardest). Grade 5 is the equivalent of metric grade 8.8 and has 3 radiating lines. Grade 8 will have at least 6 lines, grade 2, none. The basic metric range is course thread and the pitch is not normally specified. There is also a fine-pitch range. Imperial threads are in 4 series : UNC (course), UNF (fine) , UNEF (extra fine) and UN (constant pitch). The standard thread is right-handed. 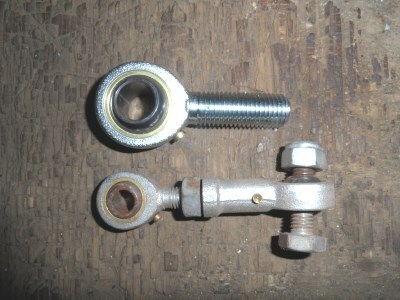 Left-handed threads are usually marked LH and are used when rotation of equipment may cause the bolt to loosen. Pitch is the distance between adjacent grooves. Metric bolts are designated directly by pitch, imperial bolts in threads per inch (TPI) which is the reciprical of the pitch. Bolts have a shoulder which has no thread. Set screws are threaded all the way to the head. Heads come in many forms. Common ones are external hexagonal, for use with spanners/sockets, or have an inset l hole for use with an allen key (hexagonal) or Torx driver (star), or a slot for a flat blade, Phillips or Pozidrive screwdriver. Heads can also be domed or countersunk. Sockets sets are available in 3 sizes, 1/4" 1/2" and 3/4". 1/4" fit from around 5mm to 13mm, 1/2" fit around 8mm to 30mm and 3/4" from about 20mm to 50mm. Impact sockets have 6 rather than the standard 8 sides, giving a tighter, stronger grip and are usefull for very tight or corroded bolts. They are suitable for use with an impact driver, standard sockets are not. Bearings normally have balls or rollers to reduce friction during rotation but can also be plain. Types include deep groove, cylindrical roller, spherical roller, taper roller, needle roller, track roller, thrust, needle roller, track roller and rod end bearing. Mouldings to house bearings include pillow block, flange unit and take-up unit. Each manufacturer of bearings has its own range and there is no agreed standard for marking but some series numbers are commonly used. The number consists of a prefix, series number, size indicator, suffix. Some common ones are given in the tables. RS Bearing with rubber seal on one side, one side open. Z Bearing with a metal seal on one side, one side open. Chain drive comes in either BS or ANSI standards. Both are based on inch units but ANSI chain is slightly narrower. The most common type is transmission chain. Others are conveyor, flat top, agricultural and leaf chain. Sprockets are available either pilot bored or with taper lock and can have multiple sets of teeth for chains 1, 2 or 3 links wide. Pilot bored sprockets without a hub are known as platewheels. Standard BS chain sizes are given as the pitch, in multiples of 1/16th inch. Friction drive belts include several varieties of 'V' belt, wedge belts, link belts , thin flat, toothed, and timing belts.